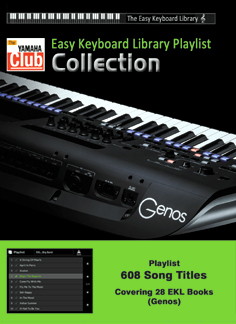 This collection provides style and voice settings for 608 songs from the popular Easy Keyboard Library series of music books. This collection was originally created for the Tyros5 keyboard. Although the majority of the settings included in this adaptation for Genos will work correctly, some of the styles originally used may not be available on Genos and a ‘close’ but different style has been selected. The software matches an appropriate accompaniment style and right-hand melody voice and sets up the instrument ready to play. The content of an individual book can be called up - allowing you to have a Music Finder list exclusively dedicated to the book you are currently playing from. ​* Please note that this software does not include new styles or voice samples.